Below is the schedule for Wednesday, Nov. 22. No Chapel or evening classes. Classes meet for 50 minutes with 10 minutes between classes. Thanksgiving Break officially begins at 1:35 p.m. Nov. 22. 7:45 a.m. (Period 1) 7:45-8:35 a.m.
9:00 a.m. (Period 2) 8:45-9:35 a.m.
10:45 a.m. (Period 3) 9:45-10:35 a.m. Noon (Period 4) 10:45-11:35 a.m.
1:15 p.m. (Period 5) 11:45-12:35 p.m.
2:30 p.m. (Period 6) 12:45-1:35 p.m.
Due to Thanksgiving Break, the deadline for the Nov. 27 edition of the Juice will be noon Tuesday, Nov. 22. Send your item to juice@wartburg.edu. 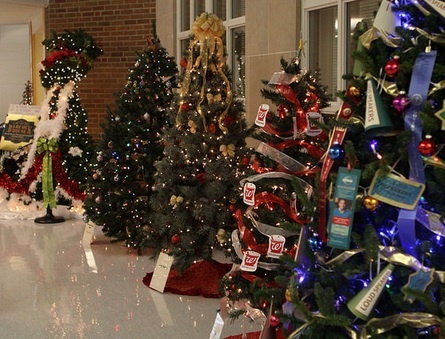 The annual Wartburg-Waverly Festival of Trees will brighten the halls of Wartburg’s Classroom Technology Center Nov. 29-Dec. 14. If your office, academic department, or group/organization would like to decorate a Christmas tree to display, please sign up by Monday, Nov. 20. For more information and/or to sign up, go to www.wartburg.edu/trees. If you have questions, email Joni McDonough. Wartburg Model United Nations will sponsor a panel event Monday, Nov. 20, 7-9 p.m., in WBC 117. The topic for the event is “What, generally speaking, is the food crisis in Yemen and in the associated North African countries? What are the causes, and what can individuals at Wartburg college do to ameliorate it?” Contact Sneha Mahapatra with questions. If you would like to have your photo attached to your Lync profile, email your request to Joni McDonough. If you are new to campus and need your headshot taken, or if you would like to have your old photo retaken, stop by the photo studio (FAC 52) Tuesday, Nov. 21, from 10 to 11 a.m. No appointment is necessary; photos will be taken on a first-come, first-served basis. For more information, email Julie Drewes. • The studio is the first door on the right. This group generally meets in conjunction with the Board meetings in October and May each year with occasional conference calls as necessary throughout the year. We encourage any interested faculty member to contact Amy Wilson, benefits administrator, at 352-8278. The Study Abroad Office invites students and faculty/staff to vote in the annual Study Abroad photo contest. The 46 submissions can be viewed on the walls outside the Den. Voting ballots are across from the photos in the Student Life Office. Each student or faculty/staff member may only vote once for one photo, and you will then be entered into a drawing for a $15 gift certificate to The Wartburg Store. Voting ends Friday, Dec. 1. The new issue of the Trumpet Magazine, out today, features ShaunQuez Ketton ‘18, Pastor Ramona Bouzard, and alumna Jeanne Edson ‘16. Click here to see it. Want to be part of the Demo Show? The Chemistry, Physics, and Engineering Club is looking to recruit volunteers to assist with the preparation for the 2018 Physics and Chemistry Demonstration Show. Interested students (from any major) are encouraged to attend an informational meeting on Monday, Nov. 20, from 8 to 8:30 p.m. in SC 134. Questions can be sent to ben.bousquet@wartburg.edu or christine.devries@wartburg.edu. Click here to see the Dining Services hours of operation for Thanksgiving break. The next Math, Computer Science & Physics Department Seminar will be Tuesday, Nov. 21, at 11:30 a.m. in SC 134. Joe Chamberlain ’18, a mathematics and computer science double-major, will present about his recent internships at the National Renewable Energy Laboratory (NREL) and Hormel Foods in a talk entitled “From the Mile High City to Spamtown, USA.” All are invited. Refreshments will be provided. Join Dean Kittle and Pastor Ramona for Wartburg CHATS, Tuesday, Nov. 28, from noon to 12:45 p.m., in the McCoy Rooms. Be part of a safe, respectful, and open conversation about topics that matter to you. There is no commitment, no homework, and no agenda. You may bring your lunch. Contact Jennifer Onuigbo in Student Life with any questions. MLK Day of Service is Monday, Jan. 15. Service opportunities are offered in the afternoon. Help the VAC with planning MLK Service opportunities by completing this form by Dec. 16 at noon. In order to accommodate your group, you must complete the form at this link. If a form is not completed, we can not guarantee service opportunities for your entire group. If you have any question please email the VAC. Thank you to students, faculty and staff members who participated in nominating dedicated individuals of the Wartburg community who exemplify the Wartburg mission statement with their dedication to service and leadership. The award will be given to faculty and staff members who embody Pastor Trachte’s enthusiasm, support, involvement, dedication and overall commitment to Wartburg’s mission of service. The award is given to students who exemplify an outstanding dedication to service and living the mission of Wartburg College. The Average Class Size Report is available on the Info Center. If you have any questions, contact Edie Waldstein. RISE (Research Internships in Science and Engineering) Germany is a program available to Wartburg students, offering undergraduate students from North American and British universities the opportunity to complete a summer research internship at top German universities and research institutions. Students are matched with a host university or institute according to their area of interest (biology, chemistry, physics, earth sciences, engineering, or a closely related field). DAAD provides students a monthly stipend for three months to help cover living expenses. Host universities and institutes provide housing assistance and match students with doctoral student mentors. Click here for more information about the program. For internship/application information, click here. If you have questions, contact Dr. Daniel Walther. Residential Life, in conjunction with International Student Services and Multicultural Student Services, will host a Thanksgiving meal for all students staying on campus over Thanksgiving break. The meal will be Wednesday, Nov. 22, from 5:30 to 7 p.m., in Chapel Commons. The turkey, drinks, and utensils will be provided, but food and monetary donations are needed to complete the meal. Please contact Jennifer Onuigbo in Student Life if you would be willing to provide a side dish, dessert, or funding. Those providing donations are welcome to join the students in food and fellowship. We have an upcoming build Dec. 2. Volunteers interested can e-mail habitat@wartburg.edu or register at the link found on Wartburg's Habitat for Humanity Facebook page. Join a new Bible study every Thursday at 7 p.m. in the Chapel Tower Room with Pastor Ramona Bouzard and Pastor Brian Beckstrom, beginning Nov. 16. The Gospel of Mark will be the topic. There is no reading required before the study, but please bring your Bible along (digital or otherwise). Join us for a Table Talk about “Reforming Education: How Might Reformation Thinking Inform K-12 Educational Change Today?” The event will be Nov. 28, 11:30 a.m. to 12:30 p.m. in Chapel Commons (lower level of the Chapel) and is sponsored by Spiritual Life and Campus Ministry. Education professor Rick Snyder will present principles and criteria driving educational reform from the Reformation era. Then we will consider principles and criteria motivating change in public education today. Participants will have the opportunity to discuss comparative educational reform efforts in 1517 and 2017. Join the ongoing work of reformation by reserving a spot for lunch, conversation and learning prior to Nov. 22. Send an email to SLCM with “Nov. 28 Table Talk” in the subject line. Include in the body of your email your name, email address, and phone number. Dr. Kunihiko Terasawa, assistant professor of world religions, presented his paper at the annual national conference of the American Academy of Religions in Boston on Nov. 17, titled, “A Buddhist Fascination with Islamic Mysticism; in the case of Toshihiko Izutsu and Ibn ‘Arabi” in the section of what Buddhists and Christians can learn from Muslims. Dr. Bill Withers, professor of journalism and communication, led 860 faculty and staff from Des Moines Area Community College (all campuses) in their annual fall workshop day Oct. 20. The workshop ran over two sessions, morning and afternoon, to accommodate all DMACC employees from across Iowa. Withers also gave the opening keynote and workshop at the Iowa Communication Alliance’s annual conference in Des Moines on Nov. 8. Wide receiver Riley Brockway ’18 spent his summer training with teammates and mentoring Waverly youth in preparation for this season the Waterloo-Cedar Falls Courier reported. The wrestling team opened its season with a 38-10 win over Simpson College, as reported by the Waterloo-Cedar Falls Courier. The men's basketball team lost an exhibition game to the University of Northern Iowa, as reported by the Waterloo-Cedar Falls Courier. The wrestling team is favored to win its 14th national championship, as reported by the Waterloo-Cedar Falls Courier. Ross Naylor ’13 and his brother are embarking on a six-month, 20,000-mile motorcycle ride from Iowa to South America to raise money for the World Riders Association, as reported by the Des Moines Register and WHO-TV. The 70th annual Christmas with Wartburg celebration was featured in the Waterloo-Cedar Falls Courier. The college's partnership with Retrieving Freedom Inc., as well as Keegan Birkicht ’15, RFI program director, were featured in a Living Lutheran magazine article written by Karris Golden ’98.